Electoral College map of the 2000 election, one of the most disputed in U.S. history. A uniquely American institution, the Electoral College consists of popularly elected representatives apportioned to each state according to the size of states' congressional delegation. It's the electors who formally elect the President of the United States. According to Berkeley statistician Elchanan Mossel, this system of electing the president is significantly more likely to result in an erroneous election outcome compared to the simple majority voting system.. The political controversy surrounding the Electoral College -- the institution whereby we elect the president of the United States -- is as old as the republic. In spite of recent contentious elections that raised the controversy to new heights, the debate is unlikely to reach a resolution given the compelling political considerations on both sides. But rarely if ever does the public debate on this subject take into account objective, mathematical considerations. UC Berkeleys Elchanan Mossel, an associate professor in the departments of Statistics and Computer Science and an expert in probability theory, believes there is an important contribution statisticians can make to the debate. He is not alone. Statisticians have subjected voting-related issues to complex mathematical calculations at least since the 18th century, when Marquis de Condorcet, a French philosopher and mathematician began using probability theory in the context of voting. Mossels analyses pit the Electoral College system against the simple majority-voting system in an attempt to test the strength of our electoral system in one key aspect: how prone to error is it and, in turn, what are the odds that the outcome of an election will actually be flipped by such random error? Mossels assumption is that any voting model is intrinsically subject to a finite error, meaning that the vote cast by a small number of voters in each election will end up being recorded differently from what those voters intended. This may be due to human error, hanging chads, or voting machines that flip some vote randomly. In a landslide election such unfortunate occurrences make no statistical difference. But in a close election  the likes of which weve often had in recent election cycles  such errors may wreck havoc with the election, with and sometimes even without our knowledge. But since most of us would prefer an alternative to dictatorship in spite of the systems robustness, the question then becomes which voting system in a democracy is most likely to produce accurate results. To that end Mossel compares all of the possible voting systems, including the two voting methods we are most familiar with  simple majority-vote and the Electoral College system, both of which offer voters two alternatives to pick from. Before running his analysis, Mossel first sets out to tests the model to ensure it satisfies some basic statistical requirements for fair elections. One such mathematical criterion corresponds to the notion of fairness among all the alternatives  meaning that the model must ensure that all alternatives (i.e., candidates) receive the same treatment. Once criteria for democracy are factored in, the problem of finding the most robust voting system becomes a problem of mathematical analysis. The reasoning is not simple. Mathematicians do not rely on standard Euclidian geometry to solve social problems of such complexity, which makes voting analysis difficult to explain on national television. Instead they apply whats known as Gaussian geometry, or the geometry of spheres in very high-dimensions. This methodology is employed when studying aggregate behavior of large numbers of people. In the context of robustness of voting, a key role is played by geometric Isoperimetric theorems, which study the relationships between volumes and surface areas. (Isoperirimetric means having the same perimeter.) To make his point, Mossel reduces the highly-complex problem to a very simple and amusing hypothetical question. The difference between this common voting method and the Electoral College system is in fact stunning. The first person to determine a way to calculate the error for these voting methods was statistician W. F. Sheppard back in 1899. He determined that majority voting takes a noise rate of x to an error thats approximately the square root of x. So under majority vote, if the voting machine flips votes with a probability of 1 in 10,000, the chance that the result of the election will be flipped is roughly the square root of that probability, or 1 in 100. We dont have the best system, Mossel says. But to the extent that the democratic ideal is for the outcome to reflect the intent of the voter as much as humanly possible, then the difference in Mossels robustness-to-error test could give political pundits food for thought. Voting theory is only one example of Mossels vast work applying probability theory to a wide range of both scientific and social problems. These range from theoretical computer science and evolutionary biology to game theory and social choice  the latter of which includes topics such as voting or economic problems. ScienceMatters@Berkeley is published online by the College of Letters and Science at the University of California, Berkeley. The mission of ScienceMatters@Berkeley is to showcase the exciting scientific research underway in the College of Letters and Science. More information: Mossels statistical analyses can be found in the following papers: "Maximally Stable Gaussian Partitions with Discrete Applications," written in collaboration with Marcus Isaksson, and "Noise stability of functions with low influences: invariance and optimality," written with Ryan ODonnell and Krzysztof Oleszkiewicz. Probing Question: Is the Electoral College an outdated system? I have not voted in presidential election since I understood what the electoral college does and never will as long as it's there. The electoral college discounts my vote and your vote too. I live in a state that always votes democratic. The only vote that counts towards the election is the one vote that gives the dems a majority over the republicans in the state, all other votes are thrown away for the national election and that one vote is turned into electoral votes. Without a country wide majority vote and the electoral college instead there are only 50 votes that count, the ones that give a majority in each state. Yes, my vote counts in my state, but it doesn't count in the overall election and that is what is wrong with college. Mathematics has little to do with it. The Electors are not bound, in any legal, moral or ethical sense, to vote as their State has voted. The Electors retain the Right to Choose the President, as they see fit. Good protection against a dangerous Populist gaining the White House. These United States' are not a Democracy. They are fifty sovereign States, joined in a Republic, choosing who the next President of their Federation is going to be. 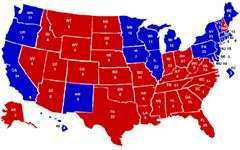 I have NEVER understood why we need the electoral college. Can anyone offer a definitive reason as to why we still use this prehistoric election system? It's called states rights and the desire for a weak president. You seem to be missing a huge part of history. Out of 535 electoral votes, there are less than 10 who actually have a choice in the matter. Almost all states have laws that require their electoral college to vote according to the popular vote of that state. Every vote, everywhere, would be politically relevant and equal in presidential elections. Elections wouldn't be about winning states. No more distorting and divisive red and blue state maps. Every vote, everywhere would be counted for and directly assist the candidate for whom it was cast. Candidates would need to care about voters across the nation, not just undecided voters in a handful of swing states. The National Popular Vote bill would take effect only when enacted, in identical form, by states possessing a majority of the electoral votes--enough electoral votes to elect a President (270 of 538). When the bill comes into effect, all the electoral votes from those states would be awarded to the presidential candidate who receives the most popular votes in all 50 states (and DC). The current system does not provide some kind of check on the "mobs." There have been 22,000 electoral votes cast since presidential elections became competitive (in 1796), and only 10 have been cast for someone other than the candidate nominated by the elector's own political party. The electors are dedicated party activists of the winning party who meet briefly in mid-December to cast their totally predictable votes in accordance with their pre-announced pledges. A "republican" form of government means that the voters do not make laws themselves but, instead, delegate the job to periodically elected officials (Congressmen, Senators, and the President). The United States has a "republican" form of government regardless of whether popular votes for presidential electors are tallied at the state-level (as has been the case in 48 states) or at district-level (as has been the case in Maine and Nebraska) or at 50-state-level (as under the National Popular Vote bill). The Founding Fathers only said in the U.S. Constitution about presidential elections (only after debating among 30 ballots for choosing a method): "Each State shall appoint, in such Manner as the Legislature thereof may direct, a Number of Electors . . ."
The fear the author's of the Constition had is coming to pass. They did NOT want a king and that is exactly what the president is becoming. Mattytheory, Just look at the map at the top of the article and you'll have your reason. The founding fathers did not want just a few populous areas deciding the presidency. I forget the exact states or numbers, but it's something like if every person in New York, Calif. and ohio voted one way they could negate the vote in every other state of the country. We're straining out gnats and swallowing camels. The real problem is that ballots are designed to make it impossible for a third party to gain any power at all. The real stupidity in the design isn't the electoral system vs. popular vote. Its in the ballot not allowing a voter to specify a second choice without having to effectively nullify his first choice. There are a myriad of ways to implement this simply. It would totally eliminate the third-candidate split effect (a third candidate splits the vote of one first-party candidate, placing the other first-party candidate in power), which has plagued so many elections. It also allows people to express their desires without punishing them by throwing away their vote when they vote third party. The political reality is that the 11 largest states rarely agree on any political question. In terms of recent presidential elections, the 11 largest states include five "red states (Texas, Florida, Ohio, North Carolina, and Georgia) and six "blue" states (California, New York, Illinois, Pennsylvania, Michigan, and New Jersey). The fact is that the big states are just about as closely divided as the rest of the country. This study is pure junk science. The study is based on the assumption that "correct" can only be that the election result corresponds to the majority of the votes cast. As such, the entire study is a tautology, discovering what it falsely assumed to begin with. The goal of the American system is NOT to elect the President simply by majority but rather to temper that States as well. The choice of simple majority vs electoral college system was subject to intense debate by the founders not for "statistical accuracy" concerns but explicitly for political considerations of preserving the rights of individual States AGAINST the tyranny of the few highly populous States. The United States is made up of a number of States and as the Electoral map shows, most of those do NOT equate to the concentrated high saturation voting of a few large States. The Electoral system is best for what it was designed and insures the unique style of American democracy protecting minority rights. One of the biggest problems with modern america is the complete lack of comprehension skills of some of our citizens. The article goes out of its way several times to state that it is not commenting on the validity of our system or the other reasons for it. The purpose of this study was SOLELY to determine the likelyhood of a miscounted vote to swing the election in a way opposite of what it should be based on the rules of the system. In our set up, the likelyhood of that to happen is 10 times higher than standard vote counts. It is NOT providing commentary on our election method if every vote was counted exactly correct. I think you miss the point. So what if all of the voters in NY, CA, and OH all vote one way and manage to outweigh all of the other voters? That would mean that more than 50% of the voting population resides in those 3 states. Are you saying that their votes shouldn't all matter just because they all happened to vote a certain way AND they make up more than 50% of the population? Because that is what the electoral college - by your assertion - is supposed to do. Shouldn't more than 50% decide a popular vote no matter what the distribution? And anyway, INDIVIDUAL people don't ever all vote one way just because they live in the same state so your scenario is preposterous. Different things are important to different people. Not everyone has access to the same information and not everyone uses the same logic to make a decision. and that is why I don't understand when people argue against this idea. That must be because you had a US public school education and never studied US history. A lot of good discussion going on here. But the Electoral College acts to make smaller states count for more. If the President never had to care about Iowa or Vermont, you would soon have some very unhappy people. Possibly even talk of revolution. For a more in depth look at this, Discover Magazine put out a great article "Math Against Tyranny". How about this: require a simple majority in the national popular vote and either a majority of the popular vote in a majority of the states and/or a popular majority in a majority of congressional districts. That seems like it'd sufficiently and fairly balance the will of the majority against the fact that 56% of the electorate lives in 11 states (and roughly a tenth in California alone), while also preventing small states from having disproportionate influence. Combined with an instant run-off/Single Transferable Vote system, a single date for the primaries, an end to the stupid caucus system in some states, and voter ID verification (no one wants to talk about it, but voter fraud is rampant, and all the pollsters can do is have you swear under penalty of perjury that you're who you say you are and haven't voted already), it'd be a much better system than the current one. An unregulated public vote can lead to a tyranny of the majority. The erection of electoral colleges and apportioned representation prevents abuses due to popularity of the abuse method. These statistical measures are but one feature of a voting system. Consider what would have happened in the 2000 election if we used a 50-state-wide, majority vote selection system. There would have been recounts not just in Florida, but in more than a dozen states, each of which could decide the entire election. Certainly some other state could have come up with 318 votes or so in the other direction. The disgust people felt with the Florida process would have been amplified by the wider uncertainty across the country, with correspondingly more challenges, more ugly party machine details emerging, and vastly more court time. Side question: does this assume a normal distribution for the vote spread across elections? Do previous elections correspond to this distribution? Does it handle varying numbers of candidates in the distribution? The idea that recounts will be more likely and messy with a national popular vote is distracting. Recounts are far more likely in the current system of state-by-state winner-take-all methods. The idea that smaller states need the electoral college is BS. Why should any citizen have different rights than another? A pure majority election makes us all equal. Here is an extreme example of what's wrong with the electoral college. What if enough of the most populous states had 100% of the votes for one candidate to get slightly less than half the electoral votes while the rest of the states all gave the win to the other candidate by one vote. This would give the LOSER around 75% of the popular vote. Moby, the USA is NOT a democracy and it was DESIGNED that way. The USA was intended as a federal system of united states. The House of Representatives were to be the peoples' representative to the federal govt. Senators were originally elected by state legislators. The president was supposed to have a more limited role and to support the balance of power idea, the president would be elected by state electors not popular vote. This would give the LOSER around 75% of the popular vote. Smaller states don't want to be controlled by cities and states with the highest population. Keep in mind that the Electoral College was created to solve the problem of travel way back when, before we had the convenience of cars and air travel. The argument that the electoral college makes small states count for more in the elections is true, but it also highlights the fact that the electoral college grossly misrepresents the popular vote. Getting rid of it would mean that the state lines would be disintegrated when it comes to the elections, so every state would be represented by exactly the voting population. No more, no less.